How to run cmd.exe with Administrator privilage in Vista? In Windows Vista you need Administrator privilege to run command line tools like SFC. Then how to run cmd.exe with admin power ? 1. 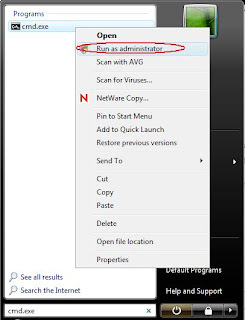 Go to start menu ,on 'Start Search' type cmd.exe ,then you can see 'cmd.exe' appears above .Right click cmd.exe and select "Run as Administrator" option from the menu (as shown in the picture. Now cmd.exe will open with administrator power . 2. Go to start menu ,on 'Start Search' type cmd.exe ,then you can see 'cmd.exe' appears above and press CTRL+SHIFT+ENTER. You will get Vista's User Account Control (UAC) dialog box to confirm current operation. You can use this method to run any application with Administrator privilege.